You have to love thermochromic ink. Think about it. How often have you grabbed a canned beverage and thought "this isn't as cold as I hoped." Essentially, this new area in design for the classic aluminum can has been out for about a year but I haven't seen many companies make good use of it. If you look at the photo on the right, one can of Coors is cold enough to drink and the other isn't -- this is noted by the color of the little mountain at the bottom of the can. I mean, no one wants a warm beer (unless you are desperate or in college) but most want a consistent level of freshness. There is also another reason why I mention this. Hey! 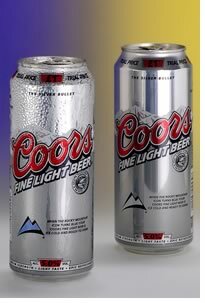 The Silver Bullet was my brew of choice back in the drinking days! I don't drink much now but if I do it's usually a Corona. I think these little "cold indicater gadgets" are brilliant! I had never heard of it till now! Thanks! I got to liking the more fattening types of beers, but my favorite lite beer is Miller Light. I had a bad experience with the Coors many years ago and haven't been able to drink it since! I'd love to taste a beer fresh brewed - I have heard from others it tastes better than the end product. Don't forget about our cousins in the U.K. They drink warm beer, and love it. While it did take a bit to get used to, I eventually warmed up (ha!) to the tradition. I'm not a beer drinker, but I have been to the Coors plant in Golden, Colorado. It was a wonderful experience.